It’s nothing new to the investment world that the Las Vegas economy has returned to healthy growth over the past several years and while locals have grown increasingly frustrated at battling all the extra traffic and construction vehicles, there is a huge sense of optimism amongst the business community that the metro is poised for steady and predictable growth over the next several years. This once sleepy “wild west” gambling town has now turned into a global destination and one area, in particular, that is seeing rapid change is downtown Las Vegas. 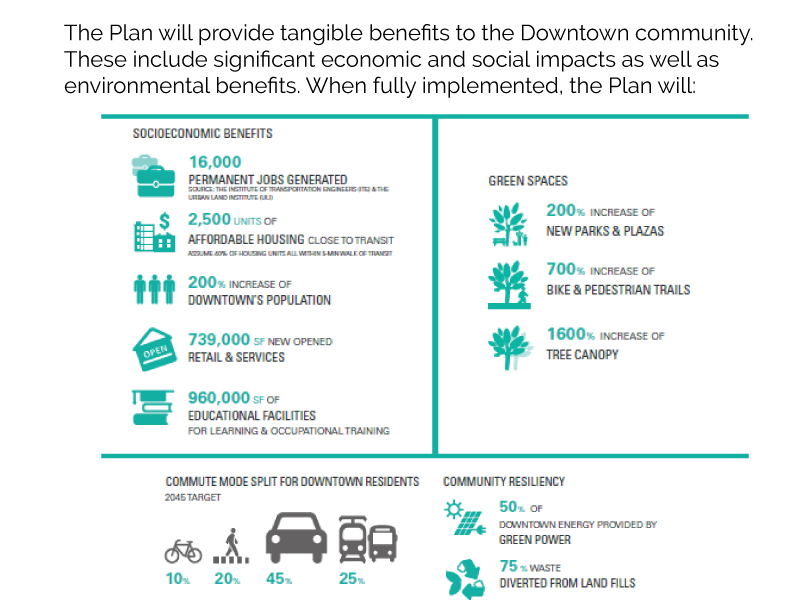 In June 2016, Las Vegas City Council formally approved and adopted the “Vision 2045” Downtown Las Vegas Master Plan – a blueprint for growth and development in the heart of the downtown core. 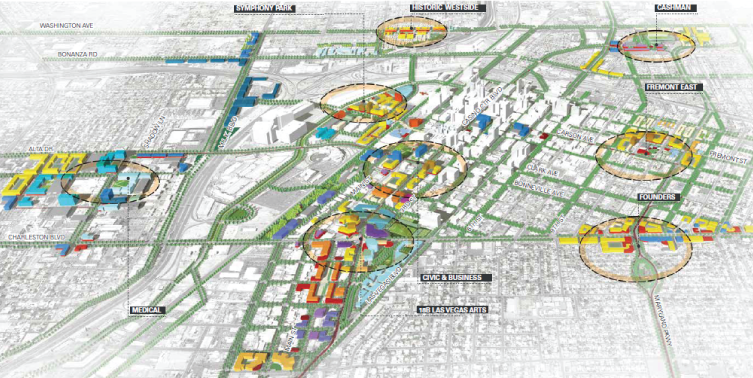 The plans focus area includes the downtown core and the surrounding districts which extend an additional 13 miles and include Cashman, Fremont East, Founders (the Huntridge area), The Arts District, Civic and Business, Symphony Park, the Historic Westside and the medical district. The plan suggests 10 mixed-use, work/live/play hubs near transit systems to maximize space and transform the roads into a layered street network with cycling, pedestrian, auto and transit grids. Another major component is the implementation of more green space to include drought-tolerant planting in open corridors and pathways, 24 acres (a 200 percent increase) of new parks, and 30 miles (a 700 percent increase) of new urban trails. In order to encourage investments, the master plan describes 6 new tools that were developed such as financial incentives, investing in infrastructure, and establishing a business improvement district that will provide services/support for local developers. The estimated socioeconomic benefits would result in 16,000 permanent jobs, 2,500 affordable housing units, a 200 percent population increase, 739,000 square feet of new retail and service space, and 960,000 new square feet of educational facilities over its course of development. Most recently, the new “Project Enchilada” plan was proposed for the Fremont East corridor based on the Vision 2045 DTLV Master Plan. A public-private collaborative concept for the business of streetscapes, open space, retail development, retail renovation and enhancement of downtown areas, the projects boundaries are Main Street to Eastern Avenue and U.S. 95 to Charleston Boulevard, which is basically all of downtown, or “the WHOLE Enchilada”. 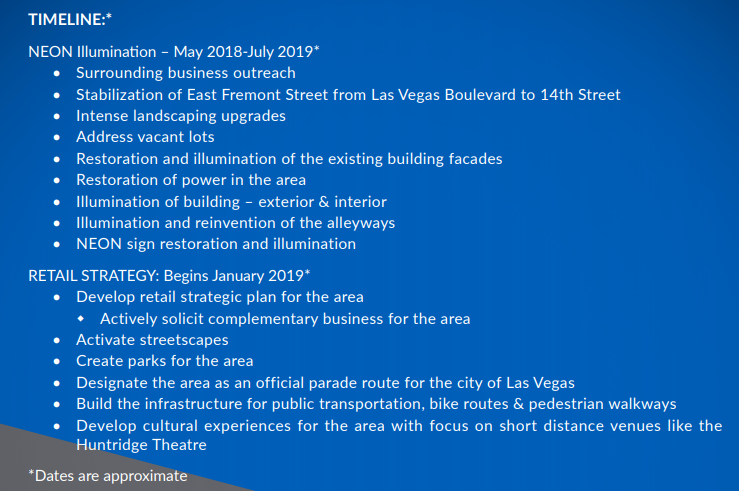 The idea is to begin by bringing green, open space, illumination and overall stabilization to East Fremont Street from Las Vegas Boulevard to 14th Street. The city of Las Vegas is working in collaboration with the local business and landowners to bring a spark of energy and eventually additional commerce to the area. The illumination being referred to is the renovation and revitalization of some of the more iconic and recognized Neon signs in the area and opening up some of the green space already there with the plan of adding a “ new energy and vibrancy “ to downtown. While this had already been a part of the public works project, adding the collaboration with the private sector as well as some nonprofits will enhance the plan already in place. Organizations like The Neon Museum, the Historical Preservation Commission, and the Commission for the Las Vegas Centennial will make sure that pieces of Las Vegas’ History will be preserved and revered. Once the “illumination” portion of this project is complete, only then will the retail strategy begin with some of the leading retail planners creating a plan for the area to recruit and retain complementary new business. This property currently on the market is right in the center of all the development. In addition to all the aesthetic and retail development, there is, of course, residential renovation in the form of completely transformed multifamily/apartment complexes. Micro-studios and live-work spaces are being renovated into the “retro-modern” mystique to tap into a demographic of hip millennials and “all-in-ones,” those who desire a variety of amenities on-site while working and playing in their surrounding neighborhoods. Buildings like Revive, Urbanity Apartments, The Pioneer, The Ogden and the recently transformed, The Neon have taken cues from the success of the “boutique bohemian” communities that have new paint to make them appealing, a new modernized interior, and courtyards some with community veggie gardens and outdoor games. The goal behind all of this development is to connect all of downtown and create a more walkable city with retail and residential close together. One such property is this rare investment opportunity close the newly approved light rail. That goal of walkability is not just a pipe-dream. Even without the infrastructure that is in place, the downtown art’s district has already achieved the highest walk scores in the city. Downtown Las Vegas has come a long way from the days where shuttered buildings, blight and crime dominated the headlines. With all the investment capital flowing into the area, it may not be long before we are calling downtown Las Vegas’ next great neighborhood. If anyone would like to read more about the Vision 2045 Master Plan, please click here. If there are any investors that would like to discuss how Fortis Commercial Advisors can assist in being a part of the Downtown Las Vegas revitalization, please click here. Join our mailing list to receive the latest listings, news, and updates from our team.